I usually don't like gold-colored charms or jewelry but decided to give it a try when I saw them on the website. I'm so glad I did. 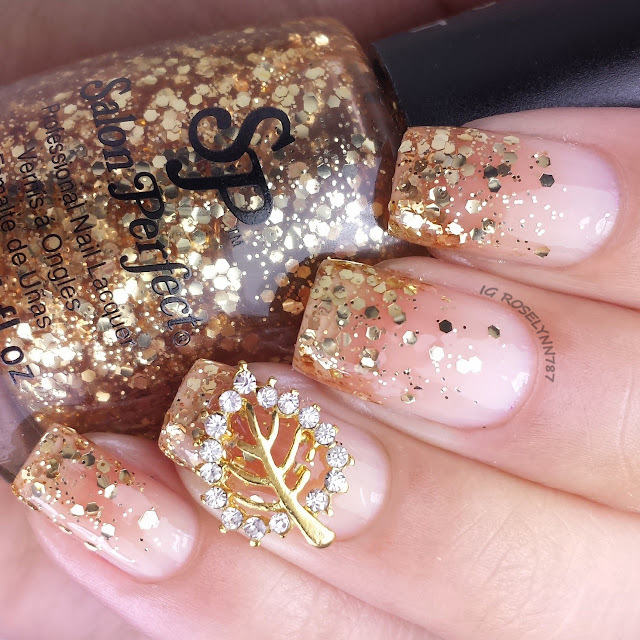 The leaf is perfect for the Fall season and looks really elegant. I can picture myself using it on Thanksgiving or for family events this month and next. The hubs took a look at it and before I even asked him what he thought he was saying "whooaaaaa that's nice". So it has the hubby seal of approval ladies, haha. Here's a little bit of a closer look so you can see it clearly. While I do really like this charm, I do have to be honest and say it's rather large. I wasn't expecting it to be so big and cover so much of my nail. 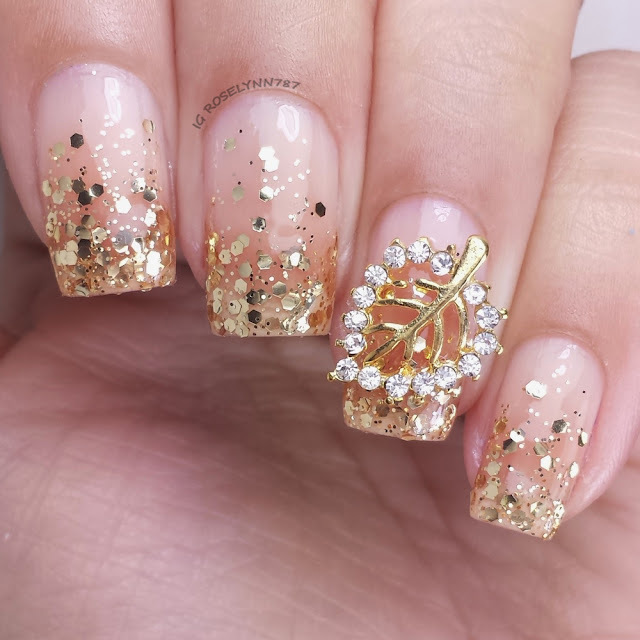 If you have small nail beds or really short nails then this charm will probably not work well for you. My nail aren't even all that long any more and as you can see in the photo below it takes up almost all of my nail bed. On the plus side, however, this charm is extremely light weight. After I saw it in the packaging in front of me I assumed it was going to be a bit bulky but it wasn't at all. This for me is a huge bonus and will make me much more likely to reuse the charm in the future. In case you guys are curious, the polish I used for this mani is called Fools Gold by Salon Perfect. In order to stick the charm on my nail, I made sure to use two coats of a thick topcoat and quickly press the charm on. This is intended for short term use and shouldn't be the method you use if you want to wear it for longer than a day. I recommend nail glue for secure placement that will last for at least a week or two. The leaf charm (item 15806) can be purchased from the Born Pretty Store for only $3.06. 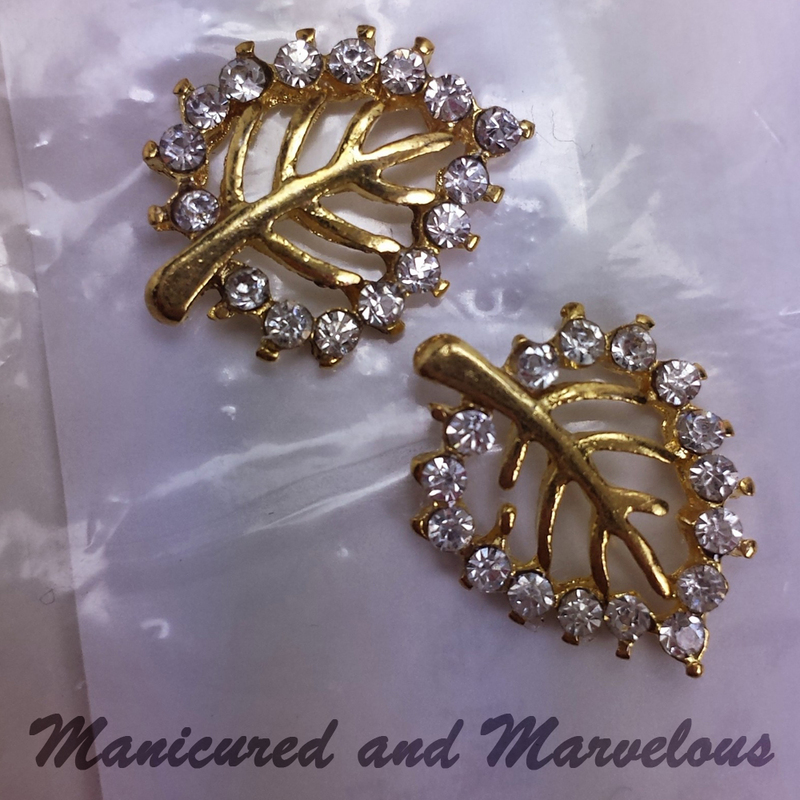 The charm comes in a set of two and is only available in this golden color. As you guys know, this is one of my favorite places to shop for nail art knickknacks. You can find a ton of items that I have reviewed from the Born Pretty Store by searching the 'Born Pretty store' tag. If you use my code ROHG10 you'll receive 10% off your purchase and as always free shipping. Shipping will take 3-6 weeks, but patience my nail lovers it's totally worth it for the great deals you can get. Thank you :D I'm always so nervous when it comes to doing glitter gradients. This is so pretty, I remember seeing it somewhere and it has been stuck in my mind since! Glad I found it again. Really nice job!